Dr Charlie Laderman (OC) is a lecturer in International History at the department of War Studies in King’s College London. He has studied across the country and also the United States where he attended both the University of Texas and Yale University. Dr Laderman’s research focuses on the relations between the United States and nations around the world. During the afternoon we were introduced to Dr Laderman’s book ‘Donald Trump: The making of a worldview’, which led into a fascinating lecture on Trump’s foreign policy. The talk gave us an insight into why Trump is the way he is on the topic of international relations, and also revealed to us how his views and methods of berating other countries haven’t changed since 1987. Dr Laderman also discussed the necessity of American involvement in various regions in relation to defence, such as in the Middle East. Later, he went on to answer a number of ‘what if’ questions, with many answers putting us on edge. Overall, this lecture was both compelling and educational which really left us thinking about what could happen in the future with such an unexpected figure directing the foreign policy of arguably the most powerful nation in the world. Edgar Jones: The Psychology of War: from shell shock to post-traumatic stress disorder. 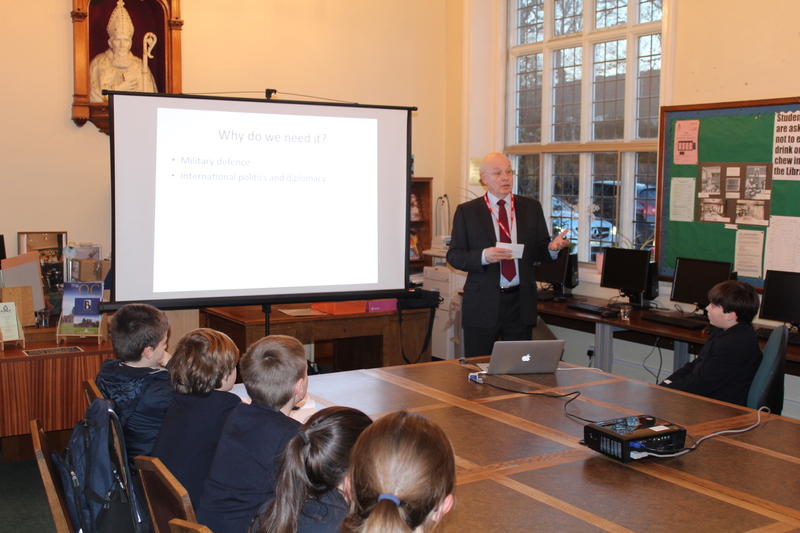 2018’s Williams Project programme began with a visit from Professor Edgar Jones (Professor of the History of Medicine and Psychiatry at King’s College London) to talk to the students about “The Psychology of War: from shell shock to post-traumatic stress disorder.” Professor Jones currently works at the Institute of Psychiatry Psychology & Neuroscience and is based in the Maudsley Hospital, which initially opened as a military hospital and then eventually as a psychiatric hospital. His talk covered mental health from both the past and today; firstly, soldiers during the First World War, with many cases reported after battles such as the Somme and the 3rd Ypres. Pictures were shown to the WP cohort of the shell-shocked soldiers of the 1st Lancashire Fusiliers, showing how war often had a deeper psychological impact after seeing physical trauma. He explained how after analysing data, he and his team found how psychological injury was closely linked to physical injury and that it spiked much higher after large amounts of fatalities/injuries (often higher than the number of deaths). Professor Jones then went on to discuss how many of those impacted by the Blitz bombings suffered from PTSD; despite shell shock having similar symptoms, PTSD is distinguished by the sufferer experiencing a deeply traumatising experience. He then went on to compare these with more modern-day events, such as terrorist attacks like the 7/7 bombings, and more recently the Manchester arena attack. Professor Jones explained how the media often misuse the term ‘panic’ when describing rational behaviour in the face of real threats, and in this way distort the responses of the public. ‘Panic’ is defined as irrational behaviour, rather than just being scared and running for safety. After a detailed Q&A with some excellent questions, the talk came to a close and several students joined the professor at dinner for continued discussion about both the talk as well as life at university. This was definitely a profound and thought-provoking talk for all, and it really showed what an impact mental health can have in times of war and distress. Thank you Professor Jones for a great start to WP 2018! On the 10th October, we had a chance to listen to representatives of Solution Not Sides organisation, whose main aim is to promote unbiased attitude to Israel-Palestine conflict. Our school was visited by Israel and Palestinian peace activists, who gave us an introduction into this important problem, as well as talked about their personal experience. We could learn not only about the background and history of the conflict, but also hear about the everyday lives of people living on the both sides. Wasim and Shay, who were the Palestinian and Israeli speakers, shared with us how they are trying to overcome that problem in their home countries, as well as presented their opinion about possible solutions to the issue. After the presentation, all Williams Project listeners could participate in the discussion and take part in questions and answers session. At the end, speakers encouraged us to think about our ideas for the possible solution to the problem, which won’t favour any side of the conflict. The presentation was a great possibility to hear about the conflict directly from people that it concerns. After this edition of Williams Project, all participants surely changed their attitude to the conflict, trying to find an effective solution, rather than opt for any of the sides. This Williams Project we had the opportunity to meet and talk to Rick Findler, a war photographer who has just come back from Syria. He has also photographed conflicts in Libya, Somalia and Iraq and his dramatic photos have headlined on major publishers such as the Guardian and the Independent. We talked about the inherent dangers and risks that come with going to war zones and what Rick’s experience of it was. He told us about both his recent and past experiences, focusing primarily on his friendships with a sniper, Macer, who went to Syria on his own accord from London, and a Syrian fighter, Sofian. He told us how Sofian had unfortunately been killed and we then progressed to discuss Sofian’s life as a fighter before discussing Rick’s other experiences. The lively discussion ended with a video Rick filmed at a previous conflict to reinforce how loud war is and exactly what life looks like on the front line. What we all took from this WP was the importance of raising awareness of war through the media, as many aspects of its danger are often ignored. On the 26th of September, author and historian Simon Webb spoke to the Williams Project on the idea of British concentration camps after the second world war, where German prisoners of war were kept to provide forced labour for farming and rebuilding after the war. This is an idea that makes the listener inherently uncomfortable, and a topic that most historians simply gloss over. However, throughout the hour, Simon Webb went into great detail around the events and details that resulted in this, the loopholes that allowed surrendered prisoners of war to be kept for forced labour, and the eventual cancellation of the program during the Nuremburg Trials. Simon kept the audience captivated throughout the talk, which culminated in his excellent answering of the questions proposed to him from the attentive audience. On Tuesday the 26th April, the Williams Project attenders were fortunate enough to listen to a talk given by our very own Mr Paul Fletcher. The presentation gave an insight into the second world war from a French perspective, by showing an abundance of marvellous clips from classic French war films including Monsieur Klein and Hiroshima Mon Amour. Mr Fletcher also articulated how there were no second world war films made during the war itself. It was only after the war ended that the French made copious amount of war films, using various genres such as love films, action films and even cartoons set during the war. The films portrayed some of the things that happened in France during the War including when the German soldiers took over the North of France, creating the German-occupied Zone, so they could use the coasts nearer to Britain, and leaving the South of France as the free zone. The film La Ligne de démarcation clearly illustrates this situation. The talk was extremely riveting and showed me an insight on the second world war which I had never seen before. On Tuesday 19 January, the Williams Project was treated to an supremely authoritative talk on the effect of the internet and the digital revolution on the work of the intelligence services. Our speaker was the former Director of the intelligence agency GCHQ, Sir David Pepper. Having spent over three decades at GCHQ, Sir David gave his audience a fascinating account of how the business of spying had changed since the days of the Cold War, and the sheer scale of the information now being sifted in the digital age. Discussion ranged from James Bond to Edward Snowden, terrorism, privacy, free speech, international crime, and the accountability of the intelligence services in a democratic state.